When Aimee Mangan is asked about her experience of being a Big Sister she responds with, “It is impactful, needed, easy, and fun. “ Aimee has been matched with her Little Sister Teyha since 2011. During that time Aimee and Teyha have participated in a wide range of activities with one goal in mind, spending time together. The pair’s outings have including baking, hiking, roller-skating, attending plays, surfing, visiting the Monterey Bay Aquarium, and watching Giants and Warriors games through donated tickets. These adventures provide a backdrop for Teyha to experience new things, share thoughts, ask questions, and receive encouragement from a caring adult role model. Aimee describes Teyha as “bright, sociable, and goal orientated.” Teyha started high school this year and Aimee is looking forward to seeing her passions and skills develop. They often talk about college and Teyha knows that Aimee is available to provide guidance and support through the process. Tehya’s mother Kristi is grateful to Aimee for the time that she has spent with her daughter. “Aimee is a very caring person and she really wants the best for Teyha; she has shown this throughout the last seven years with her time, support, and enthusiasm. There’s an old saying it takes a village to raise a child and I am very fortunate to have Aimee be a part of my village. “ states Kristi. Mentoring is a simple concept that can have powerful results. With the guidance and friendship of caring mentors, children are not limited by their circumstances. Mentors help provide children with the foundation they need to do better in school and make better life choices. Since 1982 Big Brothers Big Sisters of Santa Cruz County has served over 6,000 at risk youth, by matching them to screened and trained adult volunteers who provide guidance, emotional support and appropriate role modeling. Currently, there are over 60 kids on the waiting list for a caring mentor. For more information visit www.santacruzmentor.org or call 831-464-8691. 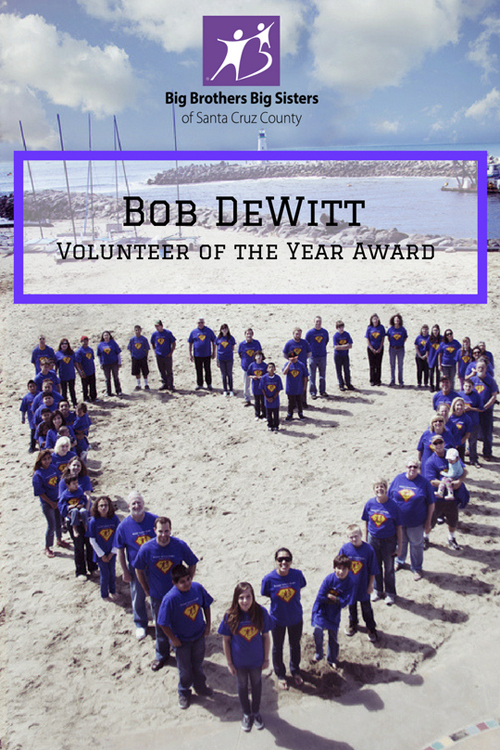 In 2017 Big Brothers Big Sisters created the Bob DeWitt Volunteer of the Year Award. It was created to mark DeWitt’s 25th year as a key organizer of the Day on the Monterey Bay Regatta. The annual race is hosted by the Santa Cruz Yacht Club. It was also the year that the event surpassed $1,000,000 in funds raised for youth mentoring. DeWitt moved to Santa Cruz in 1970 after visiting his sister. He built his professional resume by working for the County and a private firm. In 1977 Bob DeWitt started his own engineering firm. He has since sold his business to Hogan Land Services, where he still works. Bruce Donald, a local dentist, introduced DeWitt to sailing. He discovered his love of being on the water where “you can forget the woes of the world and just have fun.” That year Dewitt joined the Santa Cruz Yacht Club and has been an active member ever since. In 1992 he advocated for Big Brothers Big Sisters to become the beneficiary of the club’s annual benefit race. DeWitt really likes bringing out people that are new to sailing to the event. He also enjoys, “the festivities of the afternoon that proceed the race.” DeWitt and his wife Jan both serve on the Regatta committee, which he describes as a dedicated, fun, and hardworking team. Big Brothers Big Sisters is honored to have an annual award named after a person so deeply dedicated to youth mentoring. Bob DeWitt’s contributions to the agency have helped improve the lives of many children in Santa Cruz County. Big Brothers Big Sisters of Santa Cruz County is proud to present the 2018 Bob DeWitt Volunteer of the Year Award to Jack Sparks. For over 30 years Sparks has volunteered with the agency to help improve the lives of children. His resume includes being a Big Brother to four young men, serving as Santa Claus at the annual holiday party, and generous financial support. Jack Sparks has led a life of service both locally and internationally. In addition to his three decades volunteering with Big Brothers Big Sisters, all mentors get a free oil change through his family business, the DMV Clinic. He has offered this perk for over 20 years. Sparks also spearheaded auto mechanic training in Nepal through the International Automotive Technicians Network. He taught the students and donated tools and welding masks for their newly learned trade. Furthermore, he provided opportunities and education for the families in the area. Sparks established a way to get Nepalese art to a broader audience and guidance on why getting mercury out of the family kitchen is critical. Big Brothers Big Sisters is honored to acknowledge Jack Sparks for his service and dedication to improving the lives of others. This section is where our Bigs get to showcase their experiences being with their Littles and what it means to them to volunteer for Big Brothers Big Sisters. In 2016, I took on a “Little” named Mark. He’s a good kid. He’s quiet, polite, kind-hearted, and smart. He enjoys school and learning. His father is not actively involved in his life, but he has a very supportive mother and two sisters. His mother works extremely hard to provide a quality life for her family. On average, Mark and I spend three to four hours together a week. Sometimes we go to a community event, share a meal, or visit a local attraction. We participate in a myriad of outdoor activities such as going to the beach, hiking, fishing, basketball, and more. It’s not about spending money as much as it’s about spending quality time together. I enjoy listening to his hopes and dreams and trying to help him realize his potential. We have all heard or read “one person can make a difference” many times. I believe the most effective community youth nonprofit organizations are those that develop one-on-one mentoring with kids. 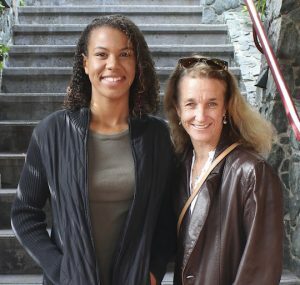 Big Brothers Big Sisters of Santa Cruz County’s mentoring program is one of the most successful. You really can make a make a difference right here in our local community. You can help change the direction of a child’s life and possibly their families’ lives. Mark’s future is bright, and it’s fun and rewarding to play a small part in it. When I began seeing my Little Brother, we spent time together – often quiet time. My Little slowly and meticulously letting his guard down and me just showing up, with no great plan, to spend time with him and see what happened. I remember one of our first outings (he was 12) I picked him up and asked if he wanted to drive. My Little clarified rather informatively that he was not of a legal driving age. Every time after that when I picked him up I always offered him the wheel, and each time he politely refused but began to smirk and get my sense of humor. Now he is 16 and the joke will be on me next month when he is grinding my clutch on the way to see a movie.A few weeks ago, after officially ending the match, My Little and I met up and shot a few baskets. We talked as friends- earnestly curious about each other’s lives. I learned a lot from him through our conversation and was in awe that this quiet 12 year old could, like his t-shirt had read for many years, now probably be my boss! I then requested he send me his most recent high school paper about the origins of the major political parties- a subject that has eluded me for some time. I am grateful for this friendship. I’m grateful for the first time I ever ran in a race was with My Little, a beach run with New Brighton middle school. I’m grateful I got to be with My Little, on the Santa Cruz boardwalk, before his first roller-coaster ride. He was scared but (little did he know) much less so than I was at his age. I am also grateful I got to be there after that first roller-coaster ride when he begged me to take him again. I’m grateful that I’ve seen My Little mature from having a gag reflex to all vegetables to now entertaining the thought that it may one day be possible to admit to liking cucumber. I’m grateful for the time we made pizza from scratch. I’m grateful that over time we developed a ridiculously long and entertaining handshake. This salutation serving as a reminder that sometimes we live by the beat of our own drums. I’m grateful My Little provides me a lens into a teenage world that I had grown to put behind me without first wholly appreciating. I’m grateful that My Little has an amazing mother who gives me homemade jam and a brilliant little sister who created an entire circus in their backyard. I’m grateful that every time my time with My Little ended- I was smiling. I’m grateful to all the people at Big Brothers and Big Sisters who choose to spend their time facilitating these unique connections and doing all the back end work required to run the program. I’m grateful that BBBS contributes such significant and essential value to a world though the scope of this value is so difficult to quantify. I’m grateful that I am given this opportunity to quantify that one of me sees and engages the world with more respect and care because of an experience facilitated by BBBS. I can quantify that my life has been positively impacted and therefore those who know me are also positively affected because of BBBS.